How Much Vitamin C Can the Body Absorb? If you consume the recommended dietary allowance of vitamin C and you don't have health problems, you should absorb plenty to meet your needs. But when you boost your intake above the RDA, you won't gain the benefit unless you spread it out over several meals or supplement doses. Consuming too much vitamin C at one time decreases its absorption into your system. Women need to consume 75 milligrams of vitamin C daily, while men should get 90 milligrams, according to the recommended dietary allowance established by the Food and Nutrition Board at the Institute of Medicine. The RDA is based on the amount you need to maintain the maximal concentration of vitamin C, without getting so much in your system that your kidneys begin to excrete excess amounts. You should not consume more than 2,000 milligrams of vitamin C daily from food or supplements. Getting more than the upper tolerable intake from any source may cause side effects, such as diarrhea and stomach cramps. The absorption of vitamin C occurs in your small intestine, where special transport mechanisms shuttle it across the wall of the intestine and into circulation. These transporters affect the amount absorbed. For example, vitamin C shares the transporters with glucose, which may limit uptake of the vitamin, according to a review of research published in the October 2007 issue of "The Journal of Nutrition." The amount of vitamin C absorbed in your small intestine is also dose-dependent, so it's influenced by how much vitamin C you consume. After vitamin C is absorbed, your kidneys regulate the amount in your system. You can count on absorbing about 70 to 90 percent of the vitamin C you get from food and supplements, as long as you don't consume more than 180 milligrams daily, according to the Office of Dietary Supplements. Your small intestine absorbs less vitamin C as your intake increases, dropping to less than 50 percent when you consume more than 1,000 milligrams, or 1 gram, of vitamin C daily. Absorption isn't the only process affected with increased intake. Your kidneys also begin to eliminate vitamin C that was absorbed, but not yet metabolized, as you consume more than 80 milligrams daily. 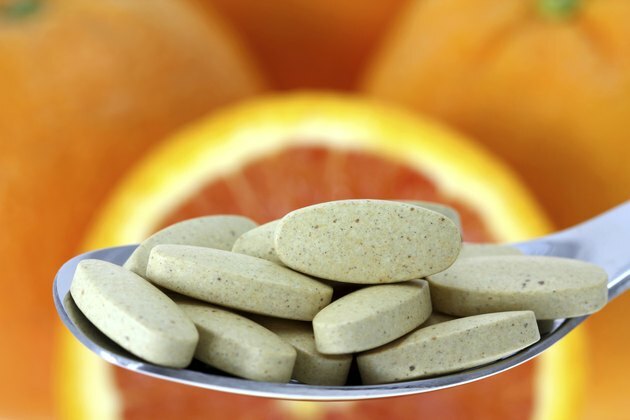 Natural and synthetic vitamin C supplements, as well as a variety of different forms, such as powder, chewable tablets or regular tablets, are all equally bioavailable, reports the Linus Pauling Institute. In other words, no matter which one you buy, it's absorbed and used by your body as well as the other types. For optimal absorption, take supplements in smaller doses, two to three times daily with your meals, according to the University of Maryland Medical Center. Instead of taking a tablet with 1,000 milligrams of vitamin C, buy supplements with 250 to 300 milligrams per tablet and take one with each meal. What Are the Benefits of B12 Pills? Are Vitamin B-12 Pills Good for Weight Loss?